The Fastime 14 Stopwatch has a unique data recall mode which enables you to store batches of split times as segments in the memory. So that if you were timing a series of races, the lap times for each race can be stored in the memory as one segment. The time of day that the race or event was started is also stored. Stopwatch, Data recall, Repeating Countdown/up timer, Pacer, Speed , Stroke rate, Alarm and time, day date display. It has a rugged water resistant and shock resistant case. Stopwatch: Measures up to 19hrs 59mins 59 secs 99/100ths sec. Triple display shows: Lap counter, Cumulative and Lap split time to the last split. Cumulative and running times. 500 cumulative and split times can be stored in memory with fastest, slowest and times identified. Time out (start, stop, resume) function is also included. Top cumulative and middle Lap Displays returns to running time after 5 seconds. Bottom cumulative display runs continuously. Data recall:The number of free (unused) memories is shown first. Press start to scroll through all the segments. The current segment will be shown first. For each segment, the segment header display will show: The date and time stamp when the segment was started The segment number and the number of laps stored in the segment. When the required segment is selected. Press the recall button consecutively to to read through all the lap and split times within each segment. Repeating Countdown/up Timer: Maximum setting 19hr 59min 59sec Display shows TARGET TIME, and COUNTING DOWN TIME. Alarm sounds at the end of each countdown/up. When set to countdown/up option, the timer counts down from the preset target time to zero, then counts up in 1/100th second until stopped. Other options are to select a repeating countdown. Or programme the timer to countdown to zero and then stop. Option to START, STOP and RESTART the countdown/up are available. Pacer Function: The pacer value can be adjusted from 05 to 240 PACES per minute. The display shows the TARGET COUNT PER MINUTE. Use this function to set and measure a required number of actions per minute. Pressing the split button increases the target count per minute. Speed Mode: Enter a distance over which time is to be measured, for example a racing circuit of 1 mile (or km). The stopwatch will then show the lap time and speed for each lap. Speed is measured in units per hour. Therefore speed = distance x 60. Stroke Rate: Measures a sample of 3 strokes or actions and returns a frequency or rate per minute. Press the start button to begin measuring the stroke rate. Display counts down from 180.Press again after 3 strokes and the display shows the rate per minute. Ideal for Swimming or Rowing. Time of day display:Hour, minute, seconds time of day with 12/24 hour option. Year Month Day Date. Alarm display:The top display shows the alarm time set. Middle display shows the date and lower display shows the time of day. When changing a battery in a Fastime watch ensure that where there is a spring it is in the correct position (under the battery), where there is a clip to hold the battery, ensure that the battery is in place under the clip making good contact with the elements. If the watch face still remains blank it may be that the watch needs re-setting, this can be done by creating a ‘U’-shaped tool from a paperclip and simultaneously touching one end to the back of the battery and the other end to the contact in the reset hole to the left of the battery bar screw. Whilst a valuable and potentially useful instrument in practice I'm disappointed as the "LAP Time" disappears after a period of 5 secs; that is not enough time to read and record the data reliably. There is no way I would have purchased this stopwatch if it had been emphasised this would happen. My previous Fastime unit retained the "LAP Time" until that recording was/is superseded by a further such reading. It is not practical to have to go back to the memory with any frequency. Overall rather disappointing and could do better. 5 out of 5 It is a Stopwatch! 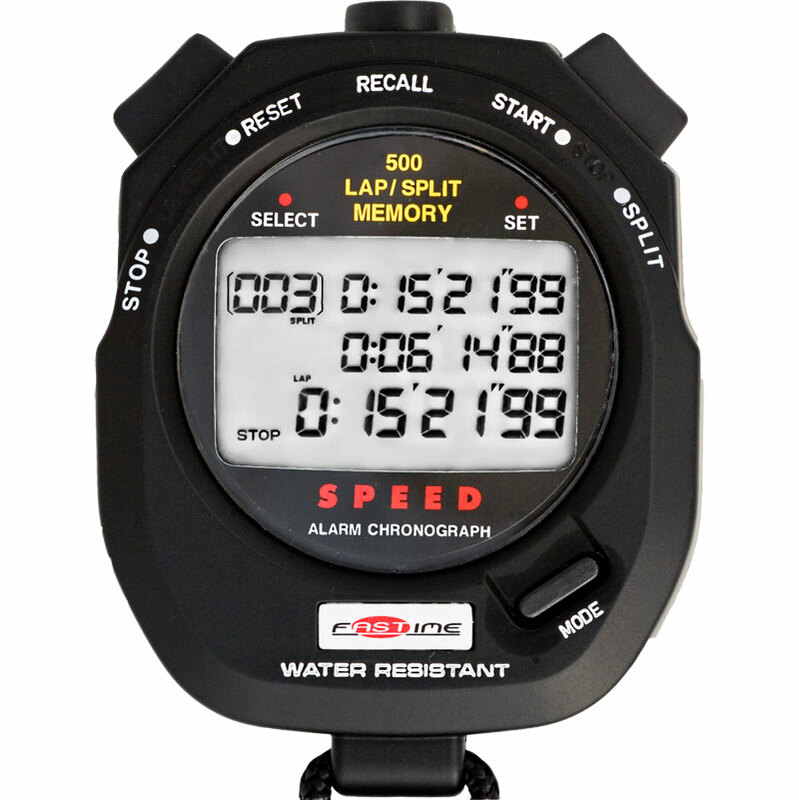 This is an excellent, waterproof stopwatch with all the functions I need for rowing coaching. Chrono, rate watch and 500 memory spaces. All the functions required for accurate, reliable time-keeping and recording rowing pieces at a fraction of the cost of the market leader. Rate recall during timing a bit fiddly, otherwise excellent. Does everything expected,one thing that may be a problem for seasoned users is the start button and the split button are both the same and on the right,usually the split button is on the left on this watch its the stop/reset so watch out!